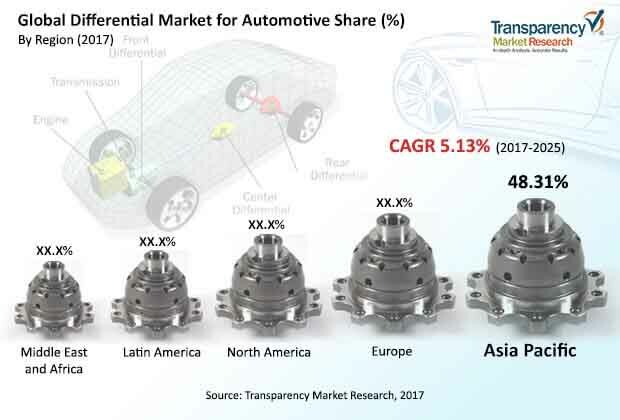 Global differential market for automotive is projected to grow at more than 5% CAGR during the forecast period 2017-2025, according to a new research report by Transparency Market Research (TMR). According to the report, the global market will continue to be influenced by a range of macroeconomic and industry-specific factors. Asia-Pacific will continue to be at the fore-front of global demand, with the market in the region growing at above 5.48% through 2025. Differential market across the globe is witnessing transformation in the automotive industry. Rise in sales of SUVs, crossovers has been noticeable in recent past years owing to the growing end user focus towards comfort, safety and large boot space. Declining car loan rates and easy availability of customizable financing options have empowered the end user to go a step ahead for buying premium cars integrated with advanced differentials. Rising urbanization and hub-spoke architecture in different countries has attributed towards the increase in overall vehicle miles driven globally by approximately 2% - 4% over the past recent years. All these primary factors are likely to pave the way for the growth of automotive differentials in the coming two to four years. The rise in demand for limited slip differential is one the major trend that will drive the market for differential during the forecast period. Limited slip differential is expected to grow at a higher CAGR of 6.76% in forecast period. It provides better traction control in snow, mud and during off road owing to its unique features. To provide better grip or provide greater differentiation between wheels, limited slip differential is an increasingly popular among top selling SUVs and cSUVs. Models M2, M3, M4, M5, and M6 of BMW are equipped with the active limited slip differential which provides locking effect depending on situation. Similarly Cadillac ATS, Chevrolet Camaro, Dodge Challenger SRT392, and Ford mustang are having limited slip differential. The electronic limited slip differentials (eLSD) is witnessing greater adoption rate on account of its better efficiency unlike mechanical differentials. Furthermore, the eLSD aids in attaining better fuel efficiency, thereby sufficing several stringent emission norms. Population amidst countries like the U.S. and some of the Asian countries prefer high driving position along with better ride quality. Crossovers are erected on a car unibody platform which combines in greatly adjustable degree structures of a sport utility vehicle (SUV) with that of passenger cars. Hence, crossovers serves end user requirements with better fuel efficiency on account of low curb weight. The increased demand towards crossovers and SUVs integrated with differentials, catering the end customer’s demand have thereby raised the opportunities for differential’s market growth in such countries. Open differentials are gradually being switched by more competent and compact eLSD for better fuel efficiency. Asia Pacific held higher market share on account of the high vehicle production in countries like China, India and Japan. The report projects differential market for automotive to grow at more than 5% CAGR and reach US$ 13.6 Bn by 2025. In 2016, Asia Pacific dominated the differential market for automotive with more than 40% market share and is expected to follow the same trend during the forecast. Demand for heavy commercial vehicles, light commercial vehicles is anticipated to rise during the forecast period due to rapid industrialization and expansion of the construction industry in Asia Pacific. Construction industry in Asia Pacific is expected to drive the market of heavy commercial and light commercial vehicle thereby reinforcing the differential’s market growth. Key players in the automotive differential industry are expected to benefit from the formation of strategic alliances with global players in the differential market for automotive market. Prominent players in the differential market for automotive market are ZF Friedrichshafen AG, Eaton, BorgWarner, Schaeffler, GKN PLC, JTEKT Corporation, DANA Limited, and Drexler Automotive GmbH, Neapco Inc.
ZF Friedrichshafen AG, GKN, Eaton and Schaeffler AG are the leading companies among all and have a large product portfolio other than differential. Eaton Corporation and Dana Ltd., are specialized in manufacturing of the differentials and they manufactures different types of differentials for automotive industry. Dana Ltd., developed the electronic limited slip differential which bridges the gap between all-wheel drive system and two wheel drive open differential system by providing better traction, which improves drivability. The differential market for automotive industry is highly consolidated with the presence of big, and medium sized manufacturers.